Spring Mountain Motor Resort and Country Club was the venue of a showdown between Pahrump law enforcement and first responders on Saturday. 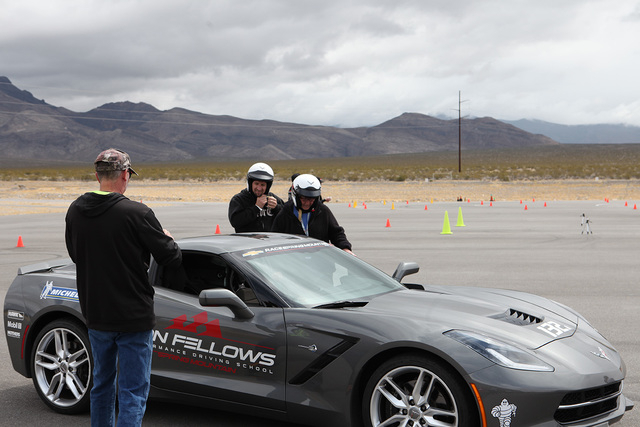 The facility hosted what’s known as a Top Gun Challenge Corvette autocross competition between members of the Nye County Sheriff’s Office and Pahrump Valley Fire and Rescue Services. The event served as a fundraiser for area organizations and agencies. Spring Mountain Resort General Manager David Petrie said they wanted to do something that would allow the first responders to have a good time and give back to the community. The inaugural event saw the sheriff’s office defeat the fire department in the electronically-timed competition, with team names consisting of Fireballs, Crispy Critters, and Irons. The sheriff’s office fielded teams named Ricky Bobby, Best of the Best, Murphmeisters, Huntsman, and Da Boss, consisting of Sheriff Sharon Wehrly. The teams spent the morning running practice laps before the afternoon competition. Drivers with the best lap accumulated time around the course contributed to the overall team time. Both the fire department and sheriff’s office fielded six teams consisting of multiple drivers. The sheriff’s office team, dubbed the Taylornators, had the best accumulated time of the day at 1 minute, 39.508 seconds. The drivers were Wesley Taylor, Kelly Jackson and Travis Buffi. The second best time of the day was the fire department’s team Fire and Ice, consisting of Matt Clayton, Albert Bass and RJ Lloyd. Fast and Furious, consisting of Fire Chief Scott Lewis, along with Josh and Jennifer Fanning had the second best time at 1:45.308. Lewis spoke about the experience. Of all of the drivers competing, Lewis said, it was a member of the fire department who earned the best overall lap time of the day. Though he wasn’t surprised with Clayton’s overall best lap time, Lewis issued a different kind of challenge for the sheriff’s office to consider. The vehicles provided for the challenge were 2016 Chevrolet Corvette Stingrays. Depending on the particular model, the 6.2 L V8 engine can churn out anywhere from 455-to-650 horsepower. Lewis referred to the vehicles as exceptional. Petrie said speed is just one aspect in getting a good lap time. Petrie noted that officials would like to make the challenge a regular event. Though the event was in fact a competition, Lewis said everyone had a great time participating. All proceeds raised from the event will be donated to local organizations and charities. Sixty percent of the proceeds went the sheriff’s office charity, Pahrump Disability Outreach Program, while 4o percent benefited the fire department’s chosen charity, Firefighters of Southern Nevada Burn Foundation.